Right before Thanksgiving I picked up the December issue of Martha Stewart Living and got inspired: time to get creative again. After many attempts were refuted by work and guilty pre-turkey-day trips to the gym, this week I finally trekked up to Manhattan's first Michael's craft store! For 2 hours it was like being back in my little hometown again (and 15 years old, with so much more free time). And Martha has a whole line of beautiful craft supplies sold there: glitter, paper punches, scrapbooking supplies, ribbon...very exciting. 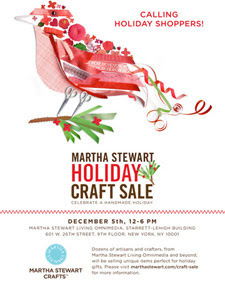 And even more so, Martha Stewart Living is having a holiday craft sale today, December 5th! I've been struggling with the crocheted snowflakes on their website. I asked a salesperson at the otherwise lovely Purl Soho shop if he knew what crochet cotton was and all I got was a "no, I don't" and that was it. Humpf. I soldiered on and bought a ball of lovely, soft, snow white Rowan 100% cotton and it was all going so well in Pattern 1 until it came to "8 ch???s". I tried to wing it despite the typo, but ended up at the end of one tip, not knowing how to get back into the center. Hm, Martha what did I do wrong? Well, I'm still really looking forward to the event, maybe I'll get even more ideas. Such a short month: Christmas is less than 3 weeks away!